Hello Blake Makers! Before I talk about these amazing looking mushrooms, I wanted to let you know that there are some changes a-comin’. New design, new features, and maybe a few surprises. Separate the stems and caps from 2 large portobellos, 1 package of creminis and 1 package of shitakes. Set the caps aside. 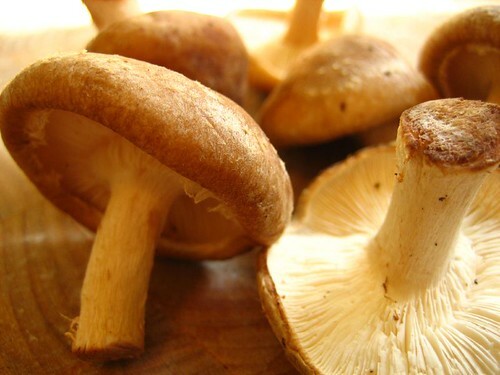 Let’s make a mushroom stock. Chop the stems. Chop 1 yellow onion. Chop 1 carrot. Add 1 tblsp. butter and 1 tblsp. olive oil and saute’ the veggies with 1 whole sprig (stem) of thyme until everything starts to get soft. Add 6 cups of hot water after that and bubble high, then bubble low for about 30 minutes. In a separate pot, saute’ 2 chopped leeks in 1/4 lb. of butter. 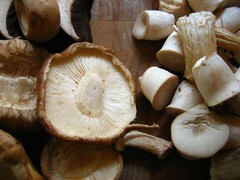 When they soften, and maybe brown a little, add in all the mushroom caps (chopped). Cook them until they’re all cooked down and maybe a little brown. Add 1/4 cup of flour and cook for about 1 minute. 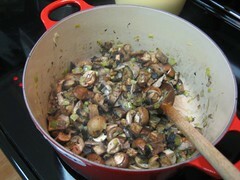 De-glaze the pan with 1 cup of white wine, and then add the mushroom stock (strained). Let this all bubble away for about 30 minutes. 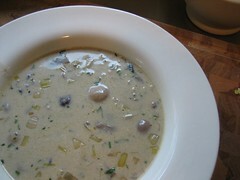 At the end (about 10 minutes before serving), add 1 cup heavy cream, 1 cup half and half, and 1/2 cup freshly chopped parsley. I need to work on this recipe. Don’t get me wrong, it’s tasty, but it’s missing something. I’m thinking hot sauce, creamy goat cheese or sour cream. Maybe a protein. I’m sure round 2 will be even better. I’m also sure Day 2 soup will be even better, too.